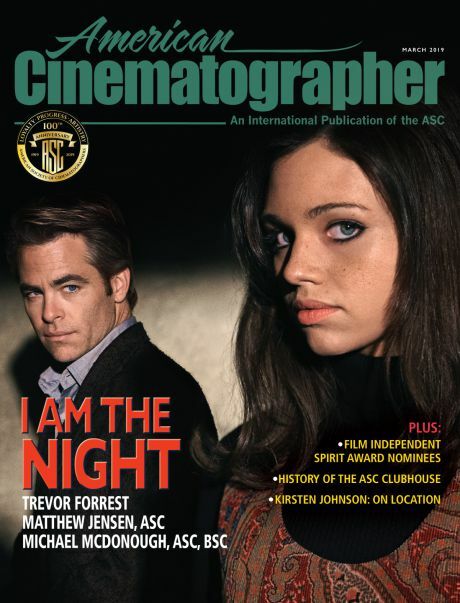 This post continues excerpts from a tribute to the late, great Gordon Willis, ASC, that I organized with Stephen Pizzello at Camerimage last November, with comments by ASC members Caleb Deschanel, Ed Lachman, Matthew Libatique and Vilmos Zsigmond. 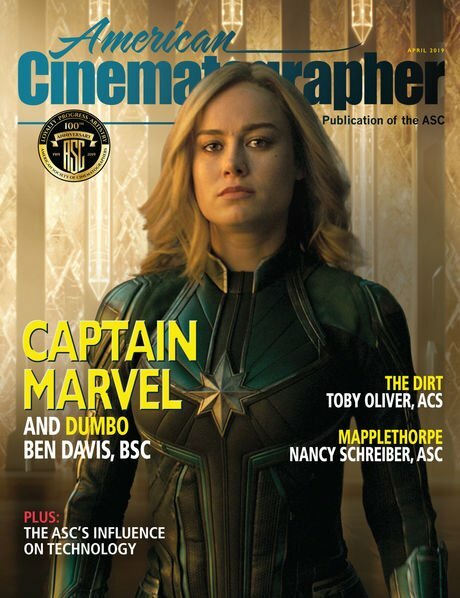 My friend Stephen is both Editor-in-Chief and Publisher of the American Cinematographer, and has also recently finished writing a book about Gordon. 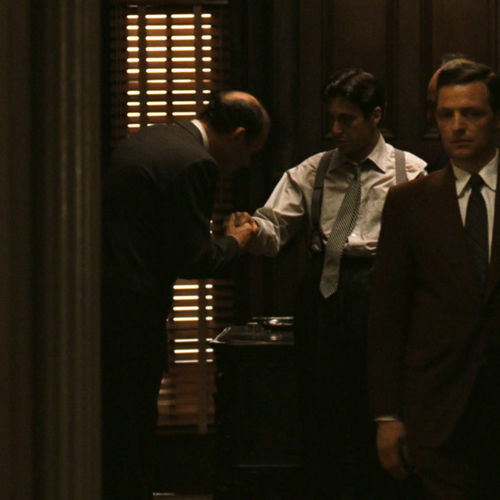 This second post focuses on the wonderful cinematography of The Godfather. If you haven't read the first post about Klute, I encourage you to do so before reading this one. Because of a prior commitment, Caleb was absent from the discussion about Klute, but he was able to join us for this portion of the tribute. During the tribute to Gordon Willis at Camerimage, we screened excerpts from The Godfather, 1972, and The Godfather Part II, 1974. 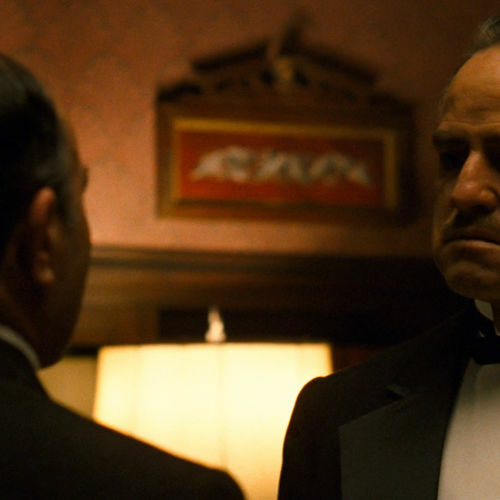 These two films by Francis Ford Coppola are landmarks in world cinema. The two films re-invented the gangster genre, and contributed to the New Wave of American film in the 1970s. Both met with great critical and commercial success. 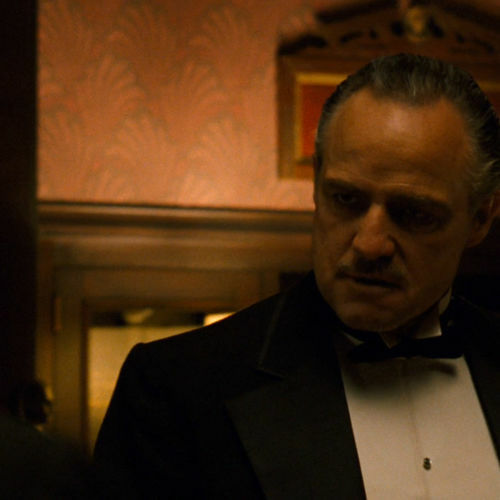 Like many masterpieces, these films have it all: engaging scripts, incredible actors, masterful directing, memorable music, evocative art direction... And then there is Gordon Willis' extraordinary cinematography that combines restrained compositions and movements with gutsy, revolutionary lighting. 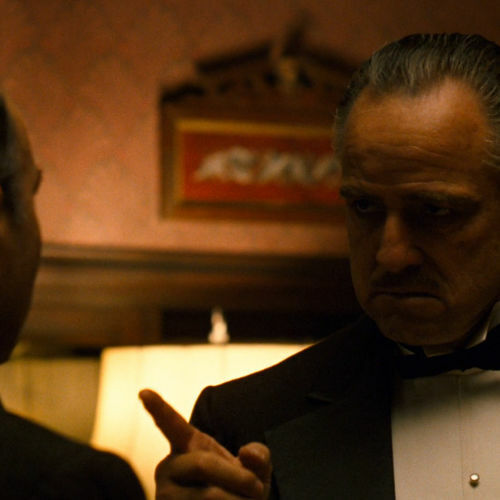 The Godfather was nominated for 11 Oscars. Amazingly, neither film was nominated for cinematography, proof perhaps that Gordon's approach was too radically different from the conventions of the day to be recognized. 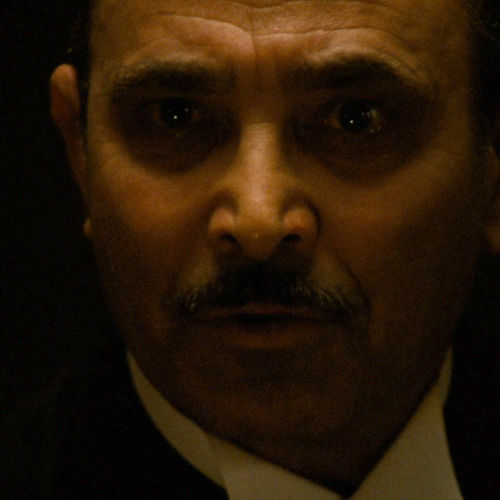 The Godfather starts with the words: “I believe in America,” and we see the close-up of the top-lit face of Bonasera, a funeral parlor owner, in a dark office. 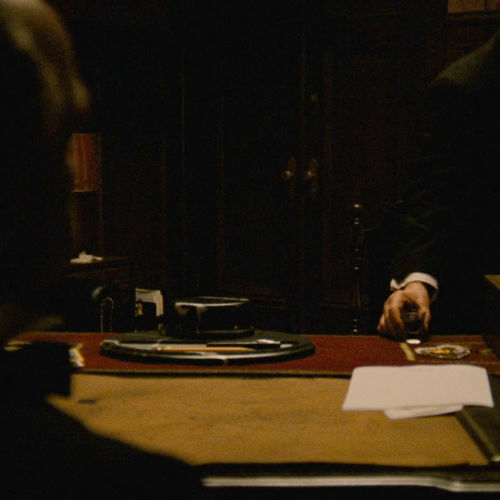 The first shot is a very slow zoom out — almost 3 minutes long — that gradually reveals the silhouette of a mysterious man behind a desk listening to Bonasera asking to avenge the violent assault on his daughter. 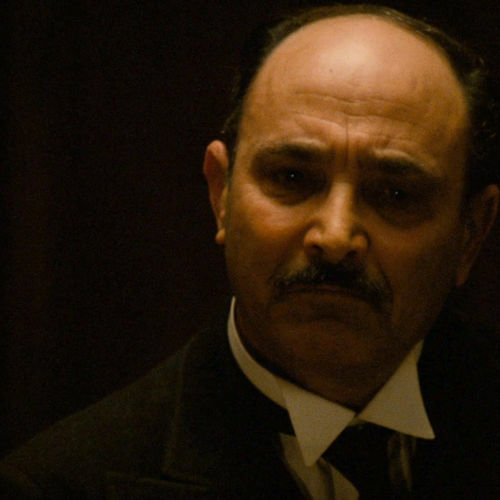 The zoom out settles to a wide shot, and Bonasera steps out of frame and comes back in the foreground to whisper his revenge wish to the Don. 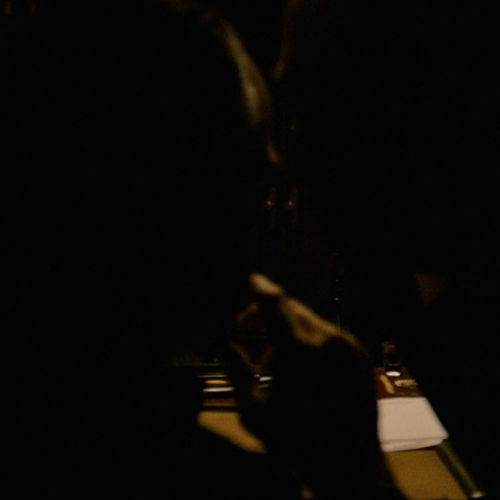 The two dark out-of-focus silhouettes obscuring the frame in the foreground are emblematic of Gordon's frequent use of concealment to create dramatic tension. 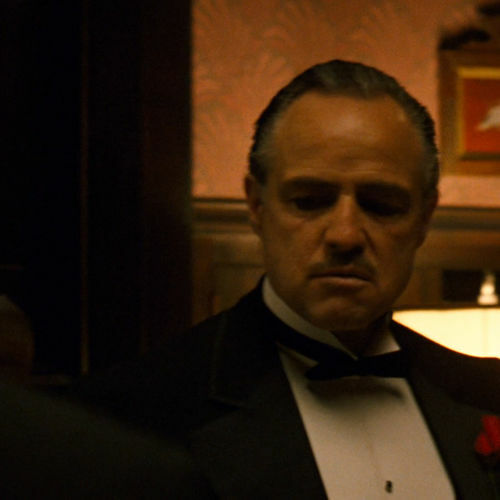 During the tribute, we started our first Godfather excerpt after the zoom, when the film cuts to reveal Vito, the elder godfather played by Marlon Brando, lit by distinctive top lighting that sometimes obscures his eyes, a revolutionary and controversial lighting technique in the 1970s. 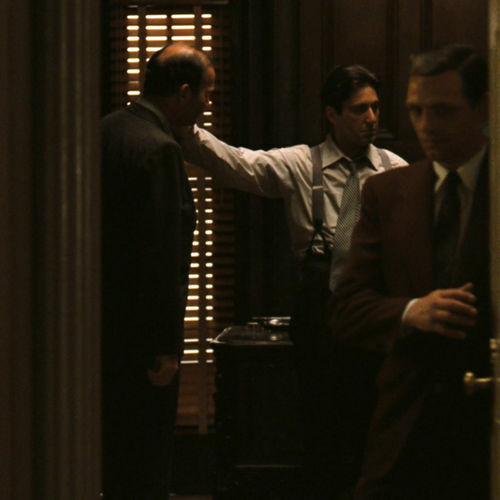 The opening scene continues with a wide shot of the godfather's office, followed by angles and reverses on Vito and Bonasera, ending with a pan that follows them to the dark doorway area. Gordon's signature lighting from above creates pools of light that Brando walks in and out of, while a shuttered window and practicals define bright background areas that silhouette the dark characters. The cut to a bright overexposed wedding scene offers a strong contrast between dark interiors and bright exteriors. Benjamin: What's really striking here is the top lighting, which Gordon created with custom "chicken coop" fixtures. Ed: They're Baylight units. That was kind of his signature. He had different variations. Sometimes he would put mushroom bulbs on battens and build skirts around them to keep the light off the walls. There are metal Baylights in Hollywood studios, but Gordon made his own lightweight ones, that he could put in locations. Today people use Kino Flos that way because there's less heat. 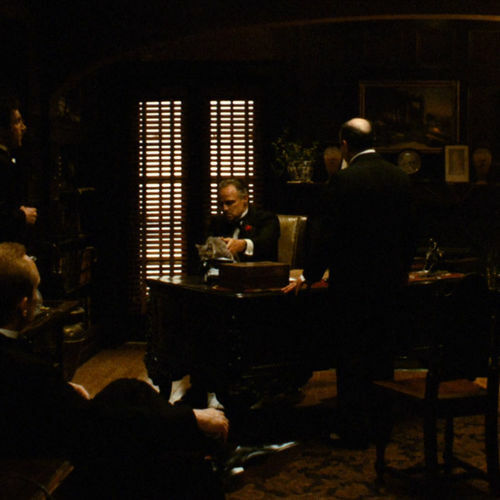 Stephen: Gordy told me that the use of top light in The Godfather really came out of a screen test that Marlon Brando did. The studio didn’t want to use Brando, so he had to submit to a screen test. Brando stuffed Kleenex into his cheeks, put shoe polish in his hair, and put a fake mustache on. The only way that Gordy could make the screen test work, was to light him from overhead. As he was looking at the test, he realized that this might work for the entire movie. Gordy said that, while overhead lighting was not a new concept, it was kind of new to extend it throughout an entire film over everyone and every thing. You definitely see that in this scene. Benjamin: The top lights are creating these pools that the actors walk in and out of. And of course there is also the darkness in the eyes, which was shocking to many people back then. Stephen: That was actually a design element on his part. Gordy said: "you don’t always want to know what this man is thinking". He felt that it really preserved the mystery of the character. He would show the eyes in certain moments, but over all he wanted to keep what the character was thinking sort of mysterious. Ed: It’s interesting that, as dark as he could make a scene, he always used highlights to separate elements in the frame. So because of the windows and the lamps, the images don't become flat, even though there is darkness in the scene and you sometimes lose information in the walls. His framing allows the highlights to come through. Benjamin: So he has a dark foreground and bright background, and vice-versa. Ed: Yeah, or some place in the frame. Behind Vito's desk there’s that strange light through the window with the blinds. That was always remarkable to me, that he would use such strong highlights in the darkness. Matthew: Gordon let the characters exist in the light in between. He created the impact of the shot photographically from the highlights, like Ed was saying. Or he added this lamp that’s not really doing anything but lighting someone's eyes ever so slightly, just so you see them. Where so many other people light the people first and let the light fall off, Gordon's never afraid to let people exist in the dark. 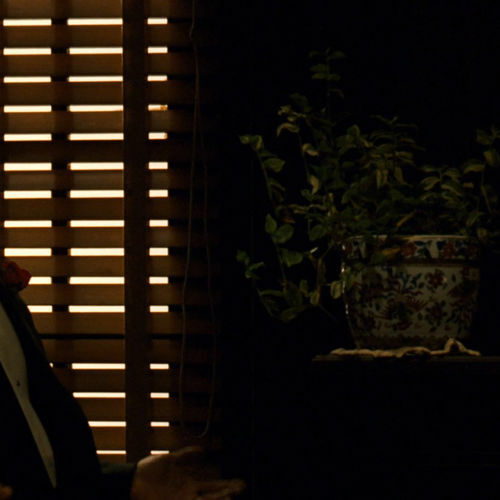 Caleb: I just did this film with Warren Beatty and he was talking about when he was doing Parallax View with Gordy there was a scene that he had to do and there was some dialogue that he felt was just too on the nose -- just too obvious, and it was really annoying for him to say it. 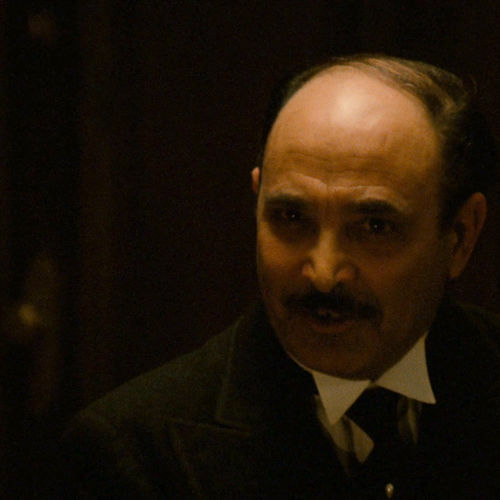 So Gordon shot the scene in such a way that Warren is in the light, and then he disappears into the dark and says the line... And suddenly it works! Gordon had a great sensibility for when you need to see somebody, when you don’t need to see somebody, what you need to see, and what you don’t need to see, to tell the story. He was really brilliant that way, and I think it escapes most people, unless you really study the work. 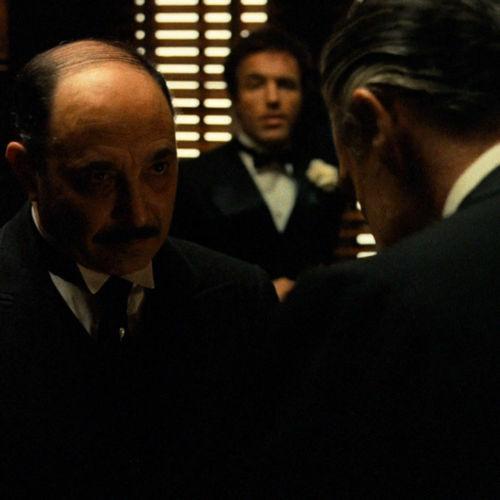 The Godfather is a great film to study in terms of what you see and what you don’t see, and how effective that is in the storytelling. Audience question: I was just curious if Gordon talked about the use of filtration in this film because it’s very warm. Steve: The brass color came from a combination of different elements. Gordy used both on-set lighting and a filter pack that he printed with. Caleb: I should give you my interviews that I did with Gordon! Early on, he told me about these chocolate filters that he used, but then later he denied using them. I had looked up the chocolate filters, and then I ran into him a couple of years later, and he said: "No, I didn’t use any chocolate filters. I don’t know what your talking about.” ... I suspect he did use chocolate filters for some of this. 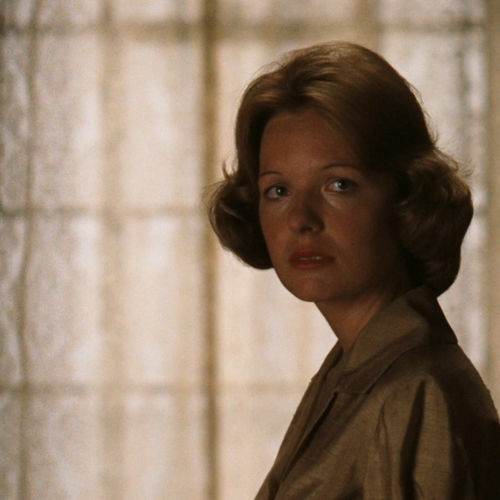 Stephen: For the wedding, Coppola told me that they were aiming for the color that home movies had before World War II, that sort of over-blown, over-exposed look in the exteriors. Vilmos: Gordy did something unique in those days, he used tungsten units to light exteriors, which we never did. We always used blue light outside, to make it white. He deliberately wanted to create this beautiful orangey look. I remember seeing the sequence when it came out, it was amazing to me. Stephen : On The Godfather, Coppola and Gordy actually had a no-zoom rule, but they started the film with the one exception to the rule. It's a really slow pull back. They had to use a computerized lens to get that zoom speed. 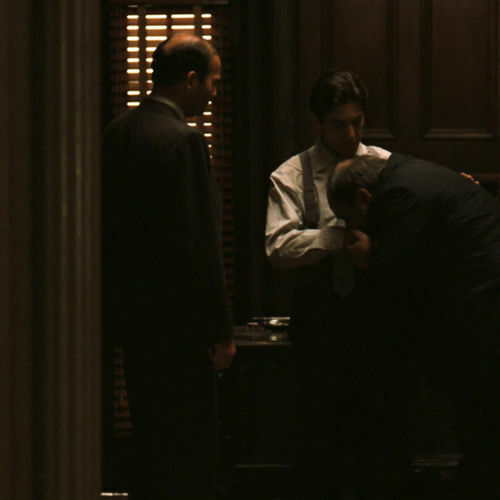 The Godfather was shot with a Mitchell Reflex camera. Gordy's lens set for Godfather 1 and 2 included Baltar lenses. They are not particularly great lenses, but he liked the feel of them for these particular films. Caleb: Gordy shot wide-open for the most part, about T2.2, so there’s very little depth of field. Caleb: Gordy would make the right choices about where to put the camera, and how to move the camera or how not to move the camera. 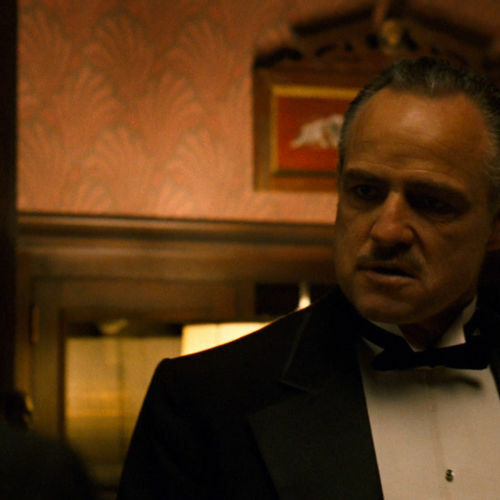 I've always said that The Godfather is typical of Gordon: the movie is actually pretty straight forward. He used a 40mm lens a lot and a 75mm lens a lot, and it’s all shot pretty much at eye level. A lot of modern filmmaking is, as David Fincher likes to say, “everything all the time”. And if you get into that, you limit the possible resources for using the visual to help tell the story. 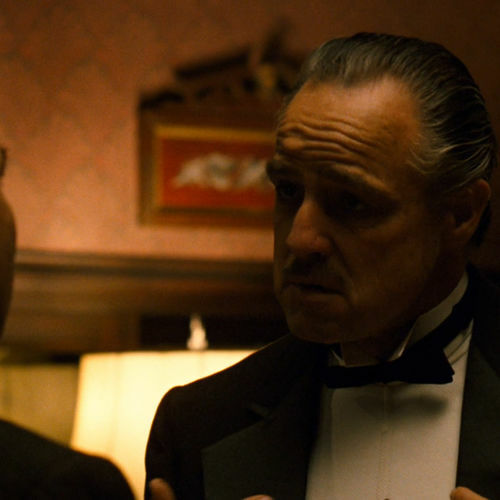 There’s the point in The Godfather when they’re shooting Don Vito and suddenly you cut to a high angle, which is really unusual in that movie. It’s a lesson on how you can help tell a story by limiting your angles, so that when you do show a different angle it means something. Benjamin: Gordon's use of the 40mm and 75mm at eye-height creates a visual consistency to the film, a kind of purity to the filmmaking. Vilmos: Some people really believe in the purity of not using a zoom lens. I don’t! 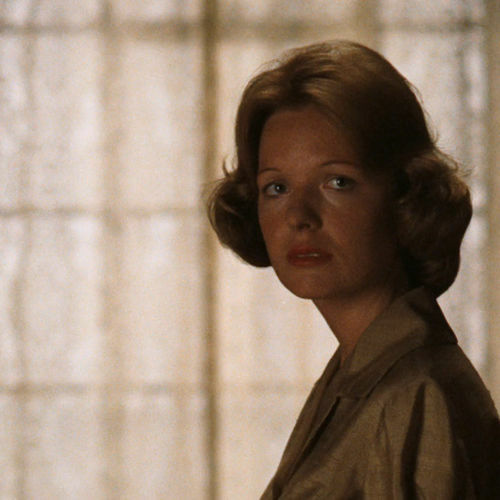 I grew up with [director] Robert Altman and he taught me to use zoom lenses all the time! He like to change lenses often. So if he wanted to go to a 45mm, it was fast with the zoom, because you have all the lens in one. 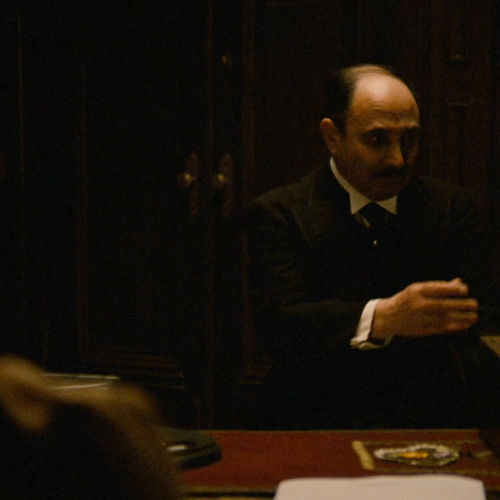 Benjamin: In many ways, Vilmos, your approach is very different from Gordon's. 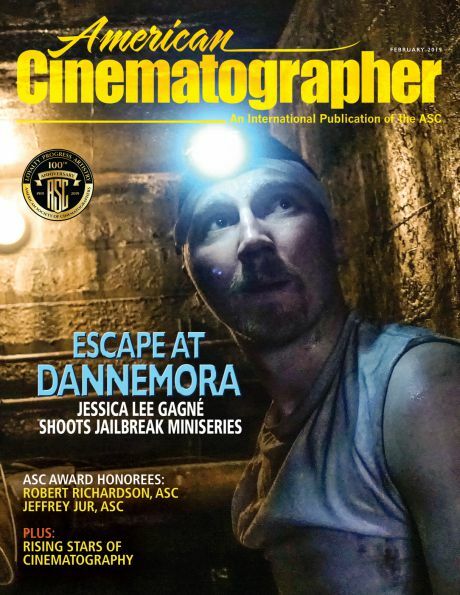 It's great to have this variety of approaches by different cinematographers. 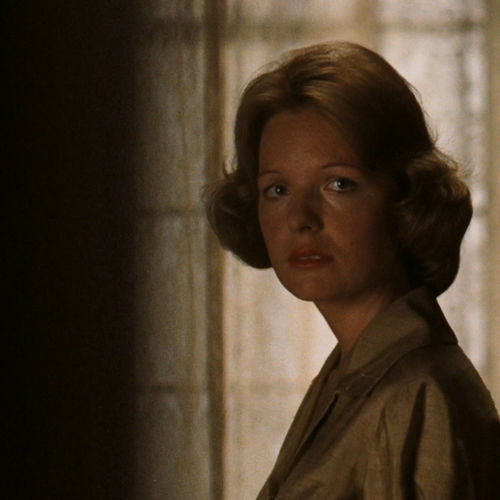 Our last excerpt from The Godfather was the very last scene, when Michael Corleone, played by Al Pacino, is confronted by his wife Kay, played by Diane Keaton. Kay asks Michael if he is responsible for the murder of his sister's husband. Michael tries to avoid Kay's persistent stare, then finally lies to his wife and denies the murder he ordered. Relieved, Kay leaves his office to fix them a drink. We cut to a wide shot with Kay out of focus in the foreground, and Michael in focus in the background. We cut to a long lens shot of men kissing Michael's hand. A henchman starts to close the door. 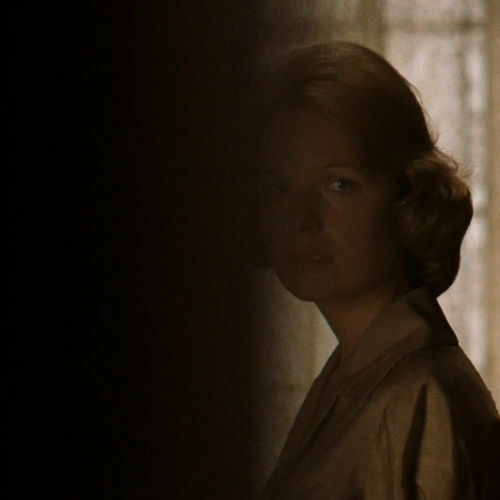 We cut to a reverse angle on Kay watching the men, as the closing door obscures her, slowly wiping the screen black. Benjamin: That closing door is an amazing piece of cinema. It’s wonderful to see how just one image can convey so much. Ed: Like Caleb was saying, Gordy understood that where you put the camera POV is storytelling. He always found the visual metaphor for telling the story. And that’s what we all should look for. Images aren’t just representational, they’re also metaphorical for what the story is. So when Gordon interpreted the script with the director, he would always have a strong opinion of where to put the camera, or what the camera saw or didn’t see. Matthew: Everything he does has pieces of information. Every shot is constructed specifically so that he doesn’t have to do five more. Caleb: It really is an amazing visual concept. Gordon really was an amazing man. I don't think that's clear to everyone who sees The Godfather. When you see the movie, you say: “Oh, that movie is really well shot”. But the reason why it’s so well shot is because Gordon had a really clear understanding of what you need to understand in every single scene.